This Kenya safari package takes 4 days. 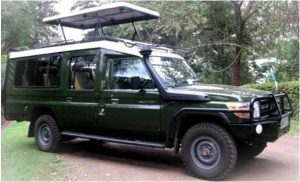 The tour starts in Nairobi taking you to Lake Naivasha, Hell’s gate National Park and Masai Mara National Reserve. You’ll have a brief stopover to view the Great riftvalley and learn more about it. Proceed to Lake Naivasha, a small beautiful fresh water lake – part of the Great Rift Valley. The name Naivasha derives from the local Masai name Nai’posha, meaning “rough water” because of the sudden storms which can arise. This freshwater lake is a birding paradise over 400 different species of bird. Reports indicate Naivasha is home to a variety of wildlife such as Buffalo,Giraffes, Zebras, Colobus monkey, Waterbucks and antelope among others. Enjoy a boat ride to witness the sizable population of hippos inside lake Naivasha. You’ll also enjoy a bike ride and you trek inside the gorges of Hells gate National park. Your next destination of the 4 days Safari Kenya is to the world renowned Masai Mara National Reserve – Kenya’s finest and most outstanding wildlife sanctuary. This Kenya Tour culminates at the Masai Mara game reserve where we marvel at the great scenery as we hunt for the Big five. We have offered a selection of economy, standard or luxury safari lodges or tented camps (depending on your style / budget). 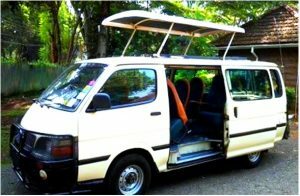 Tour transport shall be in safari designed minivan with pop up roof. 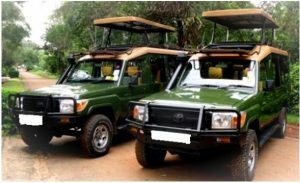 Transport in a 4 x 4 land cruiser jeep is available at an extra cost. Depart Nairobi in the morning and drive to the floor of the Rift Valley. Enjoy a brief stop at the Rift Valley viewpoint to take the most eye-catching view of the Escarpment. Proceed to Naivasha arriving at the resort in time for lunch. Enjoy an afternoon Bike ride at Hell's gate national park. There will also be a hiking safari inside the gorges accompanied by a professional guide. You’ll again enjoy an evening boat ride at Lake Naivasha that takes you to Crescent Island for a walking safari. This is one of the few places in the world where one can wander on foot amidst wild animals – there are no predators. Return to the Lodge/camp for dinner and overnight. 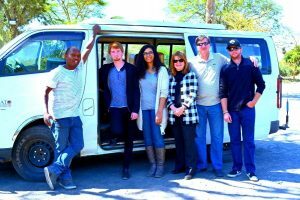 Depart Naivasha after breakfast and drive further along the floor of the Rift Valley to Maasai Mara Game Reserve, arriving at the lodge/ Camp in time for lunch. Afternoon game drive as you get a feel of this vast game filled reserve. Dinner and overnight at the lodge/ camp. We head off into the bush on an early morning game drive in Masai Mara Reserve, before enjoying breakfast back at camp. Then we return to bustling Nairobi, the capital of Kenya, arriving in the afternoon. This Budget Masai Mara & Lake Naivasha Safari ends upon arrival in Nairobi.